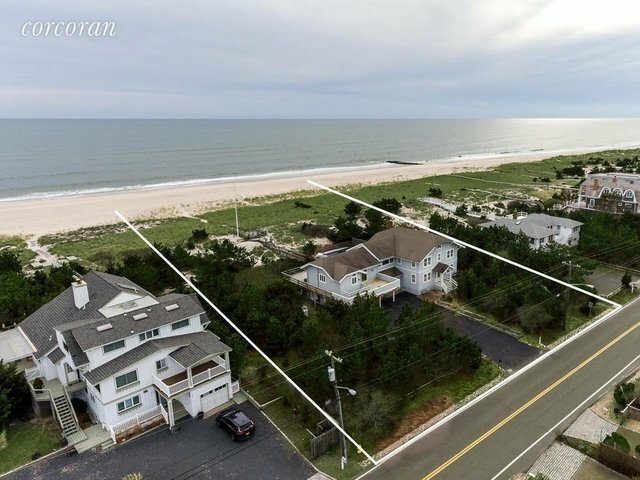 Escape to a blissful oceanfront home in desirable Westhampton Beach Village that enjoys a direct 140 foot expanse of ocean frontage, bay-front access, and fabulous water views of both the ocean and bay! You may opt to build your own custom dream beach home on the expansive 3/4 acres of private property boasting incredible width that makes it one of the largest lots on the block. The spacious 2-story home with 6 bedrooms and 3.5 baths is airy and light-filled, with generously-sized rooms for relaxing and entertaining that include a vaulted family room with walls of glass showcasing beautiful views. Enjoy the best of summer days and nights outdoors, taking a dip in the wonderful fenced-in 20x40 heated ocean-side gunite swimming pool, or sipping cocktails on your peaceful deck on the dunes overlooking blue water and sky. The location and the lifestyle simply can't be equaled! Your own access paths leads to the jetty-protected beach where you can experience beach living at its best, whether sunbathing, strolling on the sand or kayaking on the water. Your oasis awaits at a prized address on the ocean, and so do incredible possibilities!